'Inevitability' worked this time, but it hurt our democracy. News recently broke that Hillary Clinton will not be indicted by the FBI over her use of a private, in-home email server which she used as Secretary of State. 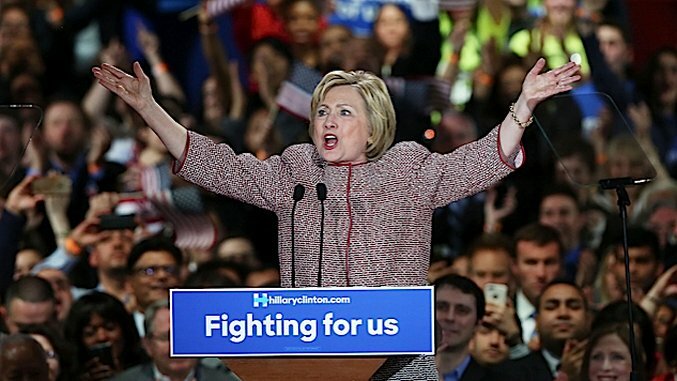 In spite of the State Department’s findings that she violated the Federal Records Act, and reports that her sever faced hacking attempts from multiple foreign nations like China, the FBI announced it was recommending no charges to be filed against Clinton. At this point, given this announcement, along with Donald Trump’s slow implosion, it has become apparent that Clinton will likely be the next President of the United States (barring a massive revolt at the Philadelphia convention). However, the implications of this political moment go far beyond simply electing America’s first female commander-in-chief. A Clinton presidency sets a dangerous precedent that the political and media establishment get to pick the president, and there’s not a thing ordinary people can do about it…yet. Twenty years later the devastating impact of the legislation is undeniable: About 90 percent of the country’s major media companies are owned by six corporations. The consolidation of news media has given birth to the 24-hour news cycle, and a constant quest for ratings and clicks. This monetary pursuit has apparently led news outlets to seemingly try to influence the news they’re reporting. This election cycle we saw the media push a race between Donald Trump and Hillary Clinton. According to a report from the Harvard Kennedy School’s Shorenstein Center on Media, Politics and Public Policy, which found that Clinton and Trump, the candidates with the most name recognition initially, got the lion’s share of coverage. Potential (and in some cases obvious) political motivations aside, a race between a reality television star and the first female presidential nominee for a major party, who also happens to be a former Secretary of State and First Lady, and has massive name recognition and support with her party, has high ratings written all over it. There are obvious problems with having money dictate news coverage. For example, the outrageous will, too often, trump the important—like when MSNBC’s Andrea Mitchell interrupted an interview with former Democratic Representative Jane Harman to go to “breaking news” about Justin Bieber. Journalism, or the “Fourth Estate”, has always had an impact on the electorate, but today’s media is abusing that privilege. Sensationalism is now beginning to inhibit change in our political system by favoring both candidates who are already well known and dangerous outrageous fringe upstarts who can generate controversy but have no real place in government. Regardless of the fact that the Clinton got the most negative coverage, name recognition and the idea that she was inevitable proved her biggest advantages over Sanders in the primary. Trump too benefited from his celebrity, and Clinton then benefited from having him be the presumptive GOP nominee. And the situation is only getting worse. Just recently, The Hill and The Economist announced that they are selling access to their reporters at the Democratic and Republican conventions this summer. This move completely undermines public opinion and empowers the wealthiest in the political establishment. At some point there must be a change or we will lose our American democracy. Either Hillary Clinton or Donald Trump as President of the United States serves as the ultimate example of this trend, and a validation of the erosion of the Fourth Estate. What is truly disturbing about Clinton is how little she has tapped into the zeitgeist of the American electorate. She’s promised incremental progress in the face of overwhelming public demand for sweeping changes that fueled the rise of Bernie Sanders, whose support goes far beyond just Democratic primary voters. And yet, in spite of that, she will likely get elected thanks to the influence of corporate media. If ever there was a time for a third party uprising, it is now.